Used in great condition. Does not come with a charger. 128GB SOLID STATE Hard Drive. Unit for sale is a Lenovo Thinkpad Yoga S1 Laptop. This machine has been fully tested, and is ready to use. Back cover has signs of prevoius usage but other wise, laptop looks good. 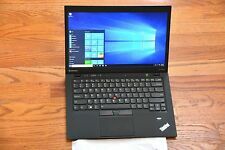 Lenovo ThinkPad X1 Carbon (256 GB, Core i7-5th Gen, 3.20 GHz, 8 GB) win 10 pro. Condition is Used.and still in a good condition Shipped with USPS Priority Mail. Condition is Used but works great. Has nvidia GeForce 940MX. A PC when you need it, a tablet when you want it, and more. The Yoga 710 (15”) is an extraordinarily adaptable PC. It features four different ways for you to do what you want: Laptop, Stand, Tent, or Tablet. Genuine Lenovo battery internal, Power Bridge provides flexibility and maximum battery life. Swap batteries without powering down your laptop. Thunder bolt 3. The laptop will arrive clean and in perfect working order.The keyboard and the palm-rest have very light wear and are in excellent working condition! Note - Box is not perfect, see picture. THIS INCLUDES INTERNAL NON-REMOVABLE BATTERIES. MOST BATTERIES CAN BE REPLACED REGARDLESS OF DESIGN. WE ALSO USE TAMPER PROOF STICKERS AND UV MARKINGS TO IDENTIFY OUR PRODUCTS. WE WILL OFTEN ACT QUICKLY TO PROCESS YOUR ORDER. Video NVIDIA 940MX 2GB Graphics. Hard Drive 256GB Solid State Drive. Warranty is through the manufacture (Dell or Lenovo) directly. I live outside the united states. How long does it take for the item to arrive?. 7130U (2.7GHz). 128GB Solid State Drive. Unique among 2-in-1s in its class, the Flex 14 features a three-sided narrow bezel display and Harmon speakers optimized with Dolby Audio Premium for an outstanding cinematic quality experience. Lenovo Yoga 3 Pro 1370 (Intel M-5Y71@ 8GB 256GB SSD ) Touchscreen. Condition is used but fully functional. Shows minor scuffs due to being used but everything works great. Shipped with USPS Priority Mail with tracking number included. Comes with original charger only..
Lenovo ThinkPad T440s 14" Notebook. - 256GB Samsung SSD. - 8GB DDR3 RAM. This Lenovo Notebook is B Grade. Screens do have wear as they are touch screen. These units are not professionally refurbished but are cleaned throughly. Up for sale Lenovo Type 20BV laptop. Windows 10 Pro. Backlit Keyboard, original Lenovo power adapter. Used, but in great working condition. Good battery life. No original box, no manual. Unlike other X270's with unspecified SSD type, thus possibly old M.2 SATAIII. Just beautiful. 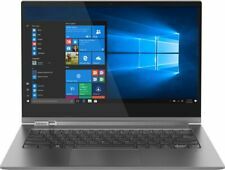 Lenovo IdeaPad Flex 5-1570 15.6" i7-8550U, 8GB, 256GB SSD, GeForce MX130, Manufacturer Warranty! Nvidia Geforce MX130 2GB GDDR5. 256GB SSD Pcie. 1.80 GHz up to 4.0 GHz (w/turbo boost technology / 8th generation), 8GB of ram DDR4. Trending at $593.32eBay determines this price through a machine learned model of the product's sale prices within the last 90 days. Lenovo Flex 4-1580. 16GB DDR4 Ram. Keyboard, touchpad and LCD screen are in very good condition, no scratches or white spots. BlueTooth 4.0. 6 Cell Battery. Core i7-8550U 1.8GHz. Battery condition: used, excellent. Minor scratches on corners. Used Lenovo S1 Yoga laptop 12.5" with Core i7 4600U 2.1GHz, 8gb, 180ssd-HDD, Touchscreen, Webcam, WIFI, BT. The unit has minor scratches on the case from normal use. Wear on the keyboard. Pictures are representative of the unit you will receive. Lenovo Flex 3. 15.6" - Functional touchscreen. Touch support with 10 touch points. SOLID STATE DRIVE OPTICAL DRIVE NO disc drive. You will receive a unit similar to the one pictured. These units have cracked screens. This is a premium Ultrabook Thinkpad that's touchscreen, thin/lightweight, great battery life (2 internal batteries), I5 processor, and it's in great condition. Has a little wear on the mousepad (picture attached), but other than that the laptop is in great condition. This Lenovo Laptop Includes a 1 Year Warranty! This Notebook is in good overall condition but. This unit was professionally refurbished by a Microsoft Authorized Refurbisher (MAR). All functionality is fully checked and then professionally cleaned. This T480s ThinkPad is in MINT condition looks NEW! Fully Covered by Lenovo Factory Warranty. Lenovo ThinkPad T480 s - QUAD CORE. 2 x USB 3.1 Gen 1 (one Always On). 16 GB LPDDR42400 MHz substantial high-bandwith RAM. 256GB SSD (Solid State Drive). Unit may show normal wear and tear (Scuffs or scratches). 1920 x 1080 ( Full HD ). WiFi Module Built-in. Bluetooth Module Built-in. Lenovo ThinkPad UltraBook T450 i5-5300U 2.3GHz 12GB 500GB HDD Win10 Bluetooth. Condition is GOOD. Battery will last 3-4 hours depending on use. Lenovo T450. Lenovo ThinkPad UltraBook T450. 12GB of Ram. No scratches on the screen or on the body. Battery life is excellent, I can usually get around 8-10 hour of use. No original box is included. Storage : 256GB SSD. RAM: 8GB DDR4. CPU: I7-8550u Quad Core. FHD 1920 x 1080 Touch. 24 GB DDR4 SDRAM. Windows 10 Pro 64-bit (English). IEEE 802.11a/b/g/n/ac. English (US) Keyboard. Brand: LenovoProcessor: Intel Core i7 8th Gen.
Lenovo ThinkPad X1 Carbon G3. It's made to last and it's truly the largest difference between the stuff you "can get" and the stuff you must have to change the way you compute. Whether it's a laptop, desktop, LCD, printer or one of our other amazing deals, each piece is coming to you off-lease. Trending at $304.88eBay determines this price through a machine learned model of the product's sale prices within the last 90 days. Make: Lenovo Model: 20B7S0J600 UPC: None. Product Line T440. Model Lenovo ThinkPad T440. Features Built-in Webcam;Touchscreen;FingerPrint Reader. Examples include, but are not limited to the following: moderate scratches, dents or cracks in the top, bottom, sides or corners of the case. Manufacturer Part No. ideapad 100-15iBD. Capacity: 500GB HDD. Manufacturer: Lenovo. Laptop: Working condition. Laptop, Battery, Original AC adapter. What do we refurbish?. We make sure everything in working order and reset to factory setting. Product Family : IdeaPad Flex 4-1480. Capacity: 1TB HDD. Manufacturer: Lenovo. Processor Type : Core i5. Designed for those who want to be different, the Flex 4 (14") has a number of features that set it apart. Type: Notebook/LaptopBrand: LenovoProcessor: Intel Core i5 7th Gen.
Trending at $181.44eBay determines this price through a machine learned model of the product's sale prices within the last 90 days. (Storage: 128GB eMMC. CONDITION: NEW (OPEN BOX). NEW OPEN BOX. Battery life varies significantly with settings, usage, & other factors.). Durability Features. Bluetooth 4.0. 802.11 a/c dual-band. audio jack.